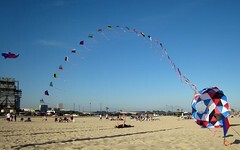 Gosh, flying kites is FUN! Yesterday was very hot (I just hope it doesn’t get humid like last year) and decided to take my boy to the beach. 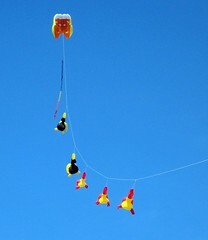 Of course, I brought far too many kites but happened to have all but one of my own creations; the only one missing was my first kite, the square flake. 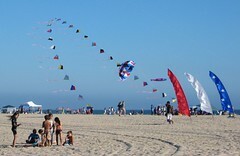 As it turned out, the beach was packed (but, because I paid for an annual pass to go to State Beaches as it is much more cost effective) but, because the beach are is so wide (we went to Huntington Beach), there was still a lot of real estate to set up shop. So. . . guess what I did (just one guess now)?! I set up my full regalia of kite creations! I’ve got to admit, it’s quite a thrill to see everything up in the air. 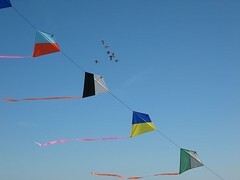 I had my new kite arch, my banners, my carp windsock, my bol, as well as my entire flock of duck windsocks. Just as exciting was the fact that there was a good, strong steady breeze. The only bad thing is that I forgot my KAP rig (darn!) 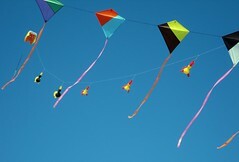 – both the weather and my kite display would have been perfect for KAPing. Oh well . . . maybe next time! Fortunately, I did have my camera and managed to get quite a few ground-based photos. Digital cameras are absolutely wonderful in that you can take as many photos as the memory card will hold and, of course, there is no need to develop anything. As a result, I know take a lot of pictures and shift through them to find the ones I like. Yesterday’s photos were not exception – I managed to get quite a few that I liked (more than I normally would). 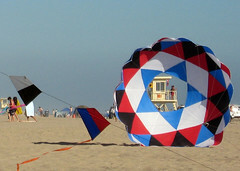 In addition to numerous views of my compete set of flying things, I had several favorites; including a photo of a mother with her child who decided to park themselves on their backs directly under my kite arch. Double clicking on the picture will open up a larger version on Flickr. Once there, look at the larger photo sizes in order to view the mom with her kid. I can’t think of anything more flattering than to have something like this occur! In addition to the wonders of enjoying the beach on a warm summer afternoon and flying kites, I’m always thrilled when any wildlife show up – in this case, a flock of pelicans flew by and, as luck would have it, I had my camera too! While I only got a couple of photos and didn’t really have time to set up my camera, I did get a couple of shots. My favorite is the view of the pelicans flying past my arch. Another one of my favorite photos happens to be one I took of my bol. I didn’t realize it until I arrived home, but the hole in the bol (no, I’m not attempting to be a poet), was centered over a life guard tower. I didn’t catch this until I was editing my pictures to post on Flickr. I cropped it in order to highlight the neat view! Finally, I was thrilled with the picture of the “duck tails” – a composite of my duck windsocks behind a partial view of my arch. In addition to the pun (which is intended), I thought it made for a rather interesting shot.